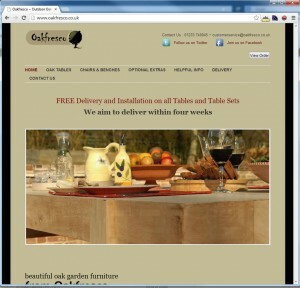 Oakfresco were a new start-up (2011) and needed a website to sell their superb range of outdoor oak furniture. The site is built using WordPress to allow easy content updates by the client and is integrated with simple shopping basket software from ‘Online Store’. Payments, invoices and customer data is handled securely by Worldpay and part of the Online Store setup. As well as building the site we provided consultancy for the Oakfresco ‘Pay Per Click’ Adwords campaings and helped to target their budget on the right type of customers. If you need help with your website or Google Adwords PPC please contact us today for a no-obligation chat.